It's a story that will forever change the way you think of the phrase, "Get Out of Jail Free." During World War II, as the number of British airmen held hostage behind enemy lines escalated, the country's secret service enlisted an unlikely partner in the ongoing war effort: The board game Monopoly. It was the perfect accomplice. "It was ingenious," said Philip Orbanes, author of several books on Monopoly, including "The World's Most Famous Game and How it Got That Way." "The Monopoly box was big enough to not only hold the game but hide everything else they needed to get to POWs." British historians say it could have helped thousands of captured soldiers escape. So how did a simple board game end up in a position to help out one of the most powerful military forces on the planet? Silk and serendipity. Of all the tools in a military-grade escape kit, the most critical item was the map. But paper maps proved too fragile and cumbersome, said Debbie Hall, a cataloguer in the map room at the Bodleian Library at the University of Oxford in Oxford, England. For hundreds of years, even before World War II, silk was the material of choice for military maps, Hall said, because it wouldn't tear or dissolve in water as easily as paper and was light enough to stuff into a boot or cigarette packet. Unlike maps printed on paper, silk maps also wouldn't rustle and attract the attention of enemy guards, she said. "Initially, they had some problems printing on silk," Hall said. "It's quite technically challenging." But then MI9, the British secret service unit responsible for escape and evasion, found the one British company that had mastered printing on silk: John Waddington Ltd., a printer and board game manufacturer that also happened to be the U.K. licensee for the Parker Bros. game Monopoly. "Waddingtons in the pre-war era was printing on silk for theater programs. For celebration events for royalty and that kind of thing," said Victor Watson, 80, who retired as chairman of the company in 1993. "It made a name for itself for being able to print on silk." He was just a child during the war but said his father Norman Watson, president of the company at the time, worked with British secret service to embed the maps in Monopoly games. He said a secret service officer named E.D. Alston (known around Waddington as "Mr. A.") used to come by to place the orders in person. "Because he was in the secret service, I never knew who he was," Watson said. Watson said his father formed a small division of the company that first printed silk and rayon maps for the British military and later embedded escape kits in hundreds of Monopoly games. Before leaving for missions, British airmen were told that if they were captured, they should look for escape maps and kits in Monopoly boards and other games delivered by charity groups. They were told that "special edition" Monopoly sets would be marked with a red dot on the free parking space. Watson said that in addition to the concealed compass, tools and maps, real bank notes were hidden under the fake money. "It was very special and very secretive," Watson said, adding that he didn't learn about the company's role helping the military until years later. Waddington printed six different maps that corresponded with regions surrounding six different German camps, Orbanes said. Monopoly kits bound for a camp in Italy, for example, would include a map of Italy and Italian currency (lira). To make sure each set reached its destination, the secret service devised another code. "Each game was pinpointed as to the camp it would go to," Orbanes said. To innocuously tag each board game, a period was added after different locations on the board. While "Mr. A." may have been responsible for bringing the war to Waddington's door, map experts credit another MI9 officer, Christopher Clayton Hutton, with hatching the master plan. "He put two and two together," Hall said, adding that Hutton was likely not alone in implementing it. "He was the first who had this idea to get maps into camps concealed in board games. It looks innocent, they wouldn't arouse any suspicion... it just looked like someone was being charitable." Hall and others familiar with the Monopoly maps say not wanting to compromise the integrity of the Red Cross, the secret service created fake charity groups to smuggle the games into the German camps. Barbara Bond, Pro-Chancellor at the U.K.'s University of Plymouth who is writing a book on silk maps, said Monopoly games weren't the only vehicles used to conceal escape maps. Decks of cards, the board game Snakes and Ladders and pencils also concealed maps for prisoners. "There was a whole industry going on," she said. During the war, hundreds of thousands of silk maps were used to help prisoners escape. And she said it marked a change in the way the military viewed POWs. During World War I, she said, "If you were captured in battle that was it." But after Winston Churchill and others shared their experiences as POWs, she said, the perception of them changed. "The POWs could still do a job," Bond said. "Not only was it their duty to fight if they were captured, it was their duty to escape." The silk (and rayon) maps and the clever ways they were distributed, she said, reflected that philosophy. Though silk maps from that era exist in libraries, homes and museums around the world, none of the original rigged Monopoly sets still remain. After the war, everything was destroyed, Watson said. But though the games themselves are gone, their legacy is a source of pride for the makers of Monopoly, past and present. "Since Charles Darrow created Monopoly in the 1930s, the game has had a rich and interesting story. 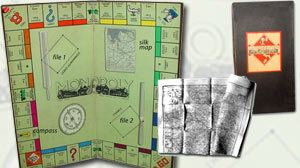 The use of Monopoly by the British government to sneak maps, money and supplies to prisoners of war during World War II is a little-known, but important part of our history," said a spokeswoman for toymaker Hasbro, Inc. "We are always honored when this iconic game becomes an important part of the fabric of a family's, or a country's, history and memories." In the 1970s, Watson had the chance to meet a few former POWs who actually used Wadddington's maps to escape from a prisoner camp at Colditz Castle, near Leipzig, Germany. "It was really exciting," he said. Although it's impossible to know precisely how many prisoners escaped with the help of the hidden maps, experts estimate that about 35,000 members of the British, Commonwealth and U.S. forces who were taken prisoner during the war returned to Allied lines before the end of the war. "We reckon that 10,000 used the Monopoly map," Watson said. +What's Next for Alleged Killer Ray Clark?